Heading into the final stretch, while the commentariat kept circulating the bogus story of an enthusiasm gap, Hillary met ardent audiences everywhere she went. At the Pasco-Hernando State College East Campus in Dade City, Florida, Alicia Machado introduced Hillary Clinton to a wildly enthusiastic audience. At the Sanford Civic Center where she held a canvass kickoff rally, she was on fire! Hillary’s last stop in Florida that night was a rally in Fort Lauderdale. She was just as energized there as she was at her first event of the day in Dade City. Before boarding her plane to take her campaign to Nevada and Arizona, Hillary greeted early voters in Lauderhill, Florida. Hillary had some very enthusiastic support in the largely Caribbean neighborhood! Hillary Clinton rallied early voters at the Plumbers & Pipefitters Training Center in Las Vegas. Hillary’s campaign circled back to the battleground state of North Carolina. She rallied voters at Pitt Community College in Winterville. Eleanor Holmes Norton and G.K. Butterfield introduced her. Mark Cuban introduced Hillary in Pittsburgh where she rallied Pennsylvania voters at The Great Hall at Heinz Field. Hillary rallied voters at the Eastern Market in Detroit. Here are highlights from Hillary’s “Get Out The Vote” event with Beyonce and Jay Z at Cleveland State University’s Wolstein Center. Hillary ran between the raindrops in south Florida. She greeted early voters in West Miami, stopped by a field office in Miami, and visited Little Haiti. Then she went on to a rally in Pembroke Pines where Randi Weingarten warmed up the crowd and Trayvon Martin’s mother, Sybrina Fulton, greeted her. Hillary attended Sunday morning services at the Mt. Airy Church of God. After services, she stopped off at the Cedar Park Cafe. Then she was on her way to Ohio for a rally in Cleveland. LeBron James brought in J.R. Smith and his little daughter to introduce Hillary at a GOTV rally in Cleveland. Of course the Cleveland crowd loved it. Even when Hillary was onscreen talking about her issues and plans, media displayed partisan or ambiguous tickers (see photo above) echoing the opposition’s preoccupations. The meme that Hillary participated in a nasty campaign is a lie. At every stop, Hillary spoke to issues she had accrued while listening to voters for a year and a half. While televising her speeches, the MSM often ran damaging tickers on the screen distracting from her words. In the end the same media sources would say it was a campaign of attacks. That is true in the sense that Hillary was attacking the issues. The media and the GOP were attacking her. The last day on the trail and that was sinking in for Hillary’s traveling press corps who took pictures with her on the tarmac in White Plains before taking off for Pittsburgh. Hillary published an op-ed that final day of the campaign summarizing her reasons for running and the objectives she developed with our input – all of ours. This document flies in the face of Joe Biden’s claim that she never figured out why she was running. Hillary has never done anything without a reason. She deliberated long and hard before entering this contest and had very solid reasons for running that she could not ignore or she never would have done it. Hillary’s final rally in Michigan was held at Grand Valley State University in Allendale where she met up with Debbie Stabenow. If ever there could have been a reminder of the republic that was at stake in this election, it was the optics of the rally in Philadelphia. The crowd filled the space where the Declaration of Independence was first read to a crowd not quite so large. The place where Benjamin Franklin, when asked what form of government was established, said, “A republic, madam, if you can keep it,” hosted Bon Jovi and Bruce Springsteen, Chelsea and President Bill Clinton, in that order, Michelle Obama, President Obama, and finally, the woman of the evening, Hillary Clinton who apparently stunned Hollywood fashionistas in her scarlet pantsuit. What we knew before the crowd at the North Carolina State William Neal Reynolds Coliseum knew it was that Bon Jovi was on the plane with all the Clintons when they left Philadelphia for the very last rally in Raleigh. What none of us knew was that Lady Gaga would be at the rally. In a nod to Madeleine Albright, she sported a big, beautiful pin on the jacket of her pantsuit. She spoke and then she performed with total Gaga gusto. And then it was D-Day. Shortly before 4 a.m. EST Hillary Clinton’s campaign plane touched down at Westchester Airport for the last time. Press and staff deboarded, and a huge hometown crowd was on the tarmac awaiting and cheering her. Only a few hours later, the Clintons were at their polling place where once again they were greeted by a large turnout of their neighbors. And then it all went sideways. We watched the returns in disbelief. The next morning, she conceded, graciously with her chin up. Many of us never hid, were never secretive, and always posted publicly no matter what the cost. Many of us have always been loud and proud. We continue to be. Some of us posted our thank-yous to Hillary here. 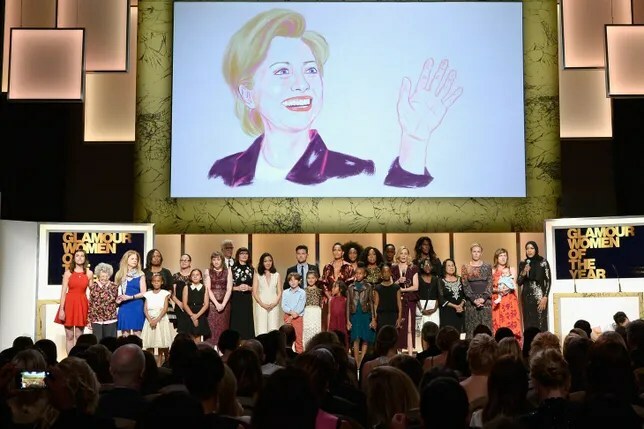 Hillary was not the honoree at this award event. Christine LaGarde was, but she joined in praising Hillary who wasn’t even there. Introducing Hillary, Marian Wright Edelman noted her overwhelming lead in the popular vote and called her “the People’s President.” Hillary admitted that making this appearance was not the easiest thing for her. She said she wanted to curl up with a good book and her dogs and never leave the house again. But she said she got up and dusted herself off because Marian exemplified that for her. There have been Hillary-sightings, several of these in the woods, leading to some interesting new Twitter accounts. Her hometown has rallied around her, of course. Toward the end of the month, the campaign responded to the many calls for a recount or an audit. Hillary made a surprise appearance at the UNICEF Snowflake Gala where her fervent supporter, Katy Perry was honored. November ended with the campaign requesting assistance with the recount which Hillary’s campaign had not initiated. Protocol allows and common sense dictates fair representation of all sides no matter where the recount request originates. November began on an optimistic note and ended with Hillary’s team still shaking our heads and not quite sure what happened except that we were pretty certain Comey’s October 27 letter did damage as did the wikileaks gusher of campaign emails. Trump’s Russian ties and vile tweets and remarks somehow got passes. More than three weeks after Election Day, many Hillary supporters were still down in our cups and dealing with shock, loss, and grief. But we will never be sorry for the run. It was glorious. We are proud of our Hillary and will defend her to the end.